Most tools that scientists use for the preparation of scholarly manuscripts, such as Overleaf and ShareLaTex, function offline and do not account for the born-digital nature of research objects. Authorea allows scientists to collaboratively write rich data-driven manuscripts on the web that offers readers a dynamic, interactive experience with an article’s full text, images, interactive figures, data, and code. In this talk, I will show you how Authorea differs from Overleaf and ShareLatex and how we are bringing scientific writing into the 21st century. Please bring your laptop as attendees will be included in the demo (not mandatory but suggested). 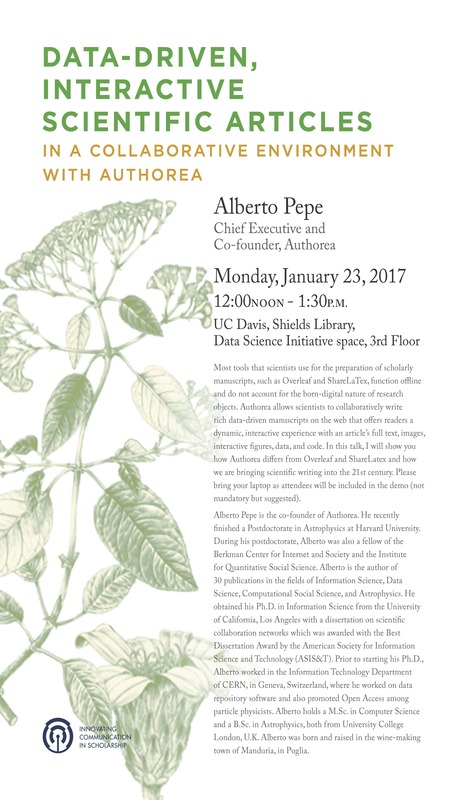 Alberto Pepe is the co-founder of Authorea. He recently finished a Postdoctorate in Astrophysics at Harvard University. During his postdoctorate, Alberto was also a fellow of the Berkman Center for Internet and Society and the Institute for Quantitative Social Science. Alberto is the author of 30 publications in the fields of Information Science, Data Science, Computational Social Science, and Astrophysics. He obtained his Ph.D. in Information Science from the University of California, Los Angeles with a dissertation on scientific collaboration networks which was awarded with the Best Dissertation Award by the American Society for Information Science and Technology (ASIS&T). Prior to starting his Ph.D., Alberto worked in the Information Technology Department of CERN, in Geneva, Switzerland, where he worked on data repository software and also promoted Open Access among particle physicists. Alberto holds a M.Sc. in Computer Science and a B.Sc. in Astrophysics, both from University College London, U.K. Alberto was born and raised in the wine-making town of Manduria, in Puglia.